Following exchange privatisation in 1997, the Company was established and became effective since 2 January 1998. It is now a subsidiary of the London Stock Exchange Group plc since 23 June 2007. In 2015, overall capitalisation for listed company on Borsa Italiana was worth €567.2 billion, representing 34.8% of Italian GDP. 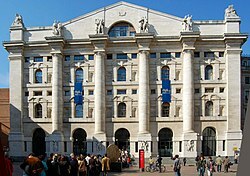 Borsa Italiana is also informally known as Piazza Affari ("Business Square"), after the city square of Milan where its headquarters (the Palazzo Mezzanotte building) is located. Borsa Italiana is chaired by Andrea Sironi while Raffaele Jerusalmi serves as CEO. The two, moreover, members of the Board of Directors of London Stock Exchange Group. The correct trading in Borsa Italiana is controlled by the statal agency of the Ministry of Treasury Commissione Nazionale per le Società e la Borsa (CO.N.SO.B.) based in Rome. On 1 October 2007, Borsa Italiana was merged with the London Stock Exchange in an all-share takeover, thus becoming part of the London Stock Exchange Group. In March 2016, the London Stock Exchange Group announced the agreement to merge in an all-stock deal with Deutsche Borse. Borsa Italiana acts as a market management firm operating with autonomy and flexibility. It organises and manages the domestic stock market along with Italian and international brokers through fully electronic trading system. Among its leading tasks, Borsa Italiana supervises listed companies, defining rules for admission and listings and supervising transaction activities. Borsa Italiana also include markets for derivatives (IDEM), ETF (ETFPlus) and bonds (MOT). For a full list see Category:Companies listed on the Borsa Italiana. ^ "Borsa in tempo reale - Listino completo - Milanofinanza.it". www.milanofinanza.it. Retrieved 4 April 2018. ^ source sense.com, "Borsa Italiana"
^ news.bbc.co.uk, "London Stock Exchange Buys Borsa"
^ www.historytour.it, "History Tour – Borsa Italiana"
^ "24 dicembre 1802: viene istituita la Borsa Valori di Roma -". parmadaily.it. 24 December 2016. Retrieved 4 April 2018. ^ "Borsa Italiana and London Stock Exchange Combine (archived 20.11.2007)". Archived from the original on November 20, 2007. ^ competitionpolicyinternational.com, "EU: LSE and Deutsche Börse officially announce merger"
^ borsaitaliana.it, "EU: LSE and Deutsche Börse officially announce merger[permanent dead link]"
^ lseg.com, "MIV: Trading "
^ lseg.com, 'IDEM Equity "
^ strategystocks.co.uk, "Milan Stock Exchange: The Italian Index "